Update: There’s a newer post that covers the gulp setup for theming Drupal 8 which highlights a few changes from this post. Don’t worry, the changes are rather minor and most of this post is still relevant. I still remember the first Drupal 7 theme I built. It was for the Singapore Gastric Cancer Consortium website, and at the time I barely knew my way around HTML and CSS. I used the Zen theme as my starter theme, and unknowingly wrote my CSS in .scss files without realising the distinction. I was a little bit confused to why I needed to install a software called Codekit to make everything work but was too busy trying to get the theme up and running to worry about it at the time. After I finished up with that project, I took the time to understand exactly what was going on. That’s when I learned what Sass was. Sass, like CSS, is a stylesheet language. It was developed as part of the HAML markup language, but has since grown into its own. Sass was invented by Hampton Catlin in 2006. Natalie Weizenbaum, the primary designer and developer of Sass, and Chris Eppstein are the main contributors to the Sass language. The full Sass documentation can be found here. Sass extends what CSS can do, by introducing useful features such as variables, nesting, mixins and so on. Browsers, however, only understand CSS so the Sass files have to be compiled into CSS for it to serve its purpose. Sass files come in two different syntaxes, Sass and SCSS, both are currently supported but SCSS is the primary syntax. SCSS is exactly the same as CSS, so renaming any .css file to .scss works perfectly fine. Sass originated as an open-source project built in Ruby. You can check out the source code here. There are many ways you can get up and running with Sass, either from a GUI application or simply the command line. The official documentation for installing Sass is pretty comprehensive. The gist of all this is, in order to use Sass in your projects, the Sass files have to be compiled into CSS files first. Dan Cederholm wrote a great article about Why Sass on A List Apart. He describes how Sass simplifies and streamlines the stylesheet authoring process. Personally, the Sass functionalities I make use of most are variables and mixins. As well as the occasional for-loop. If you want to see a true Sass pro, Hugo Giraudel is your man. He does a lot of amazing things with Sass and you should check out his blog and all his various projects. Officially, gulp is a build system. When I first heard of all these tools, like Grunt and gulp, I didn’t understand what they were. Terms like task-runner, build tools, streams and so on just flew over my head. The first article I ever read on task-runners was Grunt for People Who Think Things Like Grunt are Weird and Hard by Chris Coyier. Honestly, I didn’t get it. But it’s totally my problem and not his (he’s awesome). A fellow front-end developer tried to explain to me the benefits of Grunt, but at the time, there was nothing that I needed from Grunt which Codekit couldn’t do. So I left task-runners alone, and went about my own way. As a Mac user, I use Homebrew to handle all my development-related packages. Makes life easy when you can brew install almost all the things. To use Homebrew, you’ll need to install Command Line Tools first. A software update window will pop-up and ask if you want to install the tools now. Just click Install and agree to the Terms and Conditions. The package is around 150mb (I think) and will download and install by itself. Once that's done, install Homebrew. If it returns Your system is ready to brew then you’re good to go. And now we finally get to install Node.js. 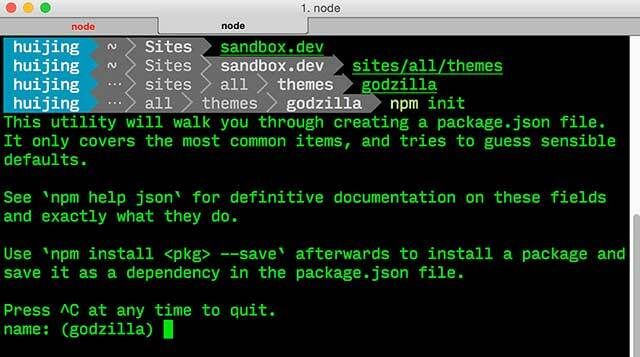 Node.js comes with NPM, which handles all your Node packages, like Gulp and Browsersync. To verify your installation, run node -v and npm -v in your Terminal. Both command should return the respective version numbers of each package. I don’t think most people care, but according to the FAQ, gulp is always lowercase, except for on the logo. But anyway, the next step is installing gulp. The -g flag installs gulp globally on your system, allowing it to be used as a command line utility, even outside of node projects. However, you will still need to install gulp locally in your project folder. gulp will always look for a locally installed gulp to pass control to. This is actually makes deployment and dependency management much easier. If you’re just starting out with Drupal theming, you can read my previous post on exactly that right here. The setup for this workflow is going to be different from the typical gulp tutorials you see on the web. Because Drupal has it’s own quirks, you know. Navigate to the root of your Theme folder and initiate a new node project. This will trigger a series of prompts for the generation of a package.json file. This file will store all the information about the required node packages for your project. Most of the prompts are pretty intuitive, and if you leave any of the fields blank, default values will be used. You can always change those values later. Set the entry point to gulpfile.js , and add information like the git repository if you wish. To prevent triggering a segmentation fault when running Drush, we need to add a script to the package.json file that will remove all .info files from the node_modules folder. Each node package has it’s own .info file and it turns out that Drush thinks that they are all part of Drupal. Unfortunately, they are not in a format that Drush recognises and hence everything blows up badly. The .info files are not necessary for gulp to run properly so it’s safe to remove them. "postinstall": "find node_modules/ -name '*.info' -type f -delete"
How do I prevent Drupal raising a segmentation fault when using a Node.js theming workflow? The --save-dev flag adds gulp, as a dependency, to your package.json file. All the subsequent gulp plug-ins we install locally will also go into this package.json file. For this case, however, we’ll add the plugins we need directly to the package.json file. Since gulp is simply a tool that helps automate tasks, we need to decide what tasks we want gulp to do for us. For example, I use Sass in my Drupal themes, so one of my tasks will be to compile Sass. This particular workflow I’m describing does not come with minification though. I made the decision to handle performance optimisation through Drupal itself. Drupal 7 comes with the option of aggregating and compressing CSS, and aggregating JS. Even though Drupal 7 does not minify JS natively, there is a module called Minify that uses Google’s Closure Compiler for compression. This workflow I’m building really just automates the actual theming process (building templates, writing styles etc.). Update: gulp-shell is apparently an anti-pattern that has ceased to be supported from gulp 4 onwards. Use child-process instead. The package.json and gulpfile.js has been updated accordingly. You’ll see a whole lot of stuff going on in your terminal, but when all is said and done, you’ll have a node_modules folder in your theme folder. This installation allows the script to prevent segmentation fault we added earlier to run as the modules are installed. For future gulp-plugins, you may have to run a script to remove their .info files. Make sure that node_modules is added to your .gitignore file because we do NOT want to commit those files. We only commit the package.json file and the gulpfile.js file. Anyone who clones the project will need to run npm install to get the project up and running. The require statement tells Node.js to refer to the node_modules folder, find the package stated in parenthesis and pass that into each respective variable in the list. These variables will be used when we write our various gulp tasks. 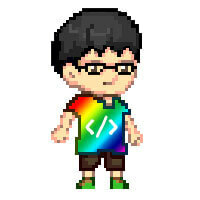 We’ll start off by creating a task to compile Sass into CSS. We’ll also use Autoprefixer to add vendor-prefixes to the file before it gets output as a CSS file in the css folder. Finally, we want the new styles to be injected into the browser (no more ⌘-⇧-R〈( ^.^)ノ). Just check that your file paths are correct. We'll also want a task for our favourite drush command, drush cc all. Clearing cache is the Drupal equivalent of "Did you turn it off and on again?". I don't know about you but if I had a dollar for every time I ran this command, I'd be sipping Piña coladas  all day on a beach in the Caribbean  by now. If you aren't using Drush, you really should. Here’s an earlier post on how to get set up with Drush. After clearing the cache, we'll also want to reload the page. gulp.task() accepts three parameters, the task name (which is a string), an array of tasks to be completed before the current task can begin, and the function that holds the logic of the task. The array is an optional argument, so it's common to see gulp tasks with only two parameters defined. Here I want the 'clearcache' task to complete before reloading the page. We want the 'sass' task to trigger when we've made changes to our .scss files and the 'clearcache' task to trigger when we've made changes to our template files. So we write another task to watch those files and trigger their respective tasks when changes have been made. Browsersync is much more than just a tool to reload your browser. The sync portion of the name comes from the fact that you can synchronise interactions across multiple browsers. So if I set up a bunch of devices whose browsers are pointing to browser-sync’s external access URL, I can control all these browsers at the same time. Scrolling, clicking, you name it. The documentation is pretty comprehensive, and it’s a good idea to familiarise yourself this extremely useful tool. You will need to install the browsersync Drupal module for this to work. Then go to Appearance > YOUR_THEME and check Enable Browsersync, and you should be all set. 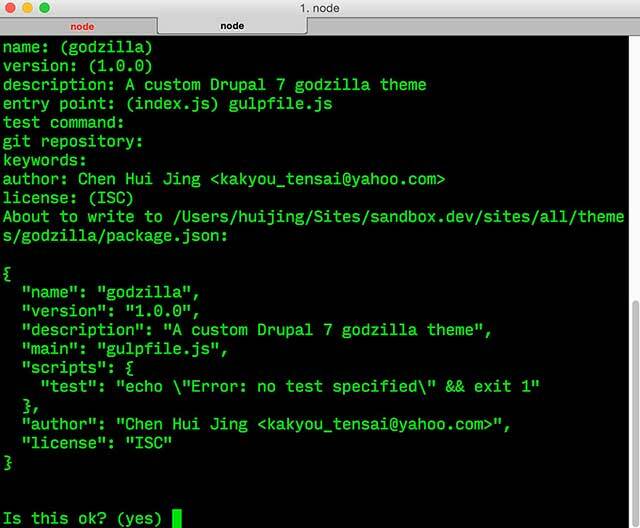 On the gulpfile.js side of things, set the proxy to whatever alias your Drupal site is on. For the domain, just set it to localhost:3000, which is the Browsersync default. When you need to do testing on other devices, replace the IP address with the one shown in your Terminal window after running gulp. // For local development only use the default Browsersync local URL. // For external development (e.g on a mobile or tablet) use an external URL. // You will need to update this to whatever BS tells you is the external URL when you run Gulp. Lastly, we're going to put everything together and write the task that runs all the things. This task will launch the Browsersync server and watch our files for changes. Each individual gulp task can be called with the command gulp TASK_NAME, by naming this task 'default', we can run it by just typing gulp. &ast; compile Sass files, launch Browsersync & watch files. Your terminal should look like the last screenshot above, and your browser will have a new window open with the URL pointing to http://localhost:3000. There will be a brief notification in the right corner that says Connected to BrowserSync. Now, when you write your styles, they will magically update in the Browser without you having to do anything. I learnt a lot throughout the process of trying to use gulp as part of my theming workflow and also spent a good amount of time googling issues. 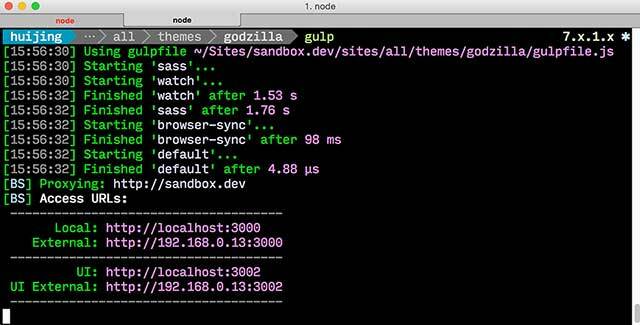 And hopefully some of the stuff I mentioned will save you some troubleshooting time when you set up your own theme to use gulp.